Flexible Cable - RMDV-SB slim flexible cable with special elastomer insulation and twisted pairs. 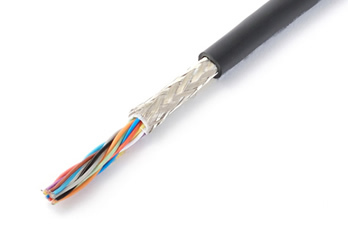 Designed to reduce cable diameter more than other cables, the RMDV series uses 80-micron extra-fine wire for the conductor and a special proprietary elastomeric material for the insulation offering excellent flexibility and wear resistance. The cable’s sheath uses PVC for excellent flame retardancy, oil resistance, and flexibility. The RMDV-SB has a braided shield that prevents outside electrical interference.